“Apps and mobile devices have put technology in the hands of all educators and kids, creating access to technology at a scale that is unprecedented,” says Caroline Fraser, vice president of Digital Products and Production at Scholastic Media. In her role, Fraser leads the consumer interactive business and develops the digital strategy for Scholastic. She and her team have created over 100 critically acclaimed games. Education and education technology are in Fraser’s blood. Prior to being at Scholastic, she was the founding Assistant Director of the educational technology division at the Museum of Natural History. She has also worked in production roles at both Disney and Sesame Workshop. 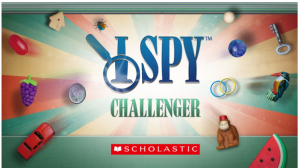 Fraser and Scholastic recently released the app, I SPY Challenger, on the Windows Platform, and today through Sunday, May 25, the I SPY Challenger app will be free to download from the Windows store. According to Fraser, I SPY Challenger is a first-of-its-kind, interactive multiplayer board game made for a touch-centric platform. The app is specifically designed for all-in-one devices and is the first I SPY digital game that allows up to four players to compete against each other, playing riddles and games simultaneously. The riddles and games are designed to be fun yet challenge players to use logic, categorization, and visual discrimination skills as they race the clock to solve riddles and complete games. I’d love to hear what you think of the I SPY Challenger app. Let me know all about your experiences with it @anthonysalcito. I hope you enjoy today’s Daily Edventure with Caroline Fraser. What inspired you to start making education based apps? Apps are a natural extension of the goal of my division at Scholastic Media, which is to extend our brands to platforms where kids are playing. We began makings apps in 2009, when app content started gaining relevance among kids and families. We saw an opportunity to engage kids and cultivate learning through technology and platforms that captivate their attention and are fun. We’re extremely proud of the I SPY Challenger app for Windows 8, which is based on a best-selling and very popular books series byJean Marzollo and Walter Wick.We approached the I SPY Challenger app asa design challenge, like we do with every new project. The challenge was to create a multi-player game that takes advantage of the multi-touch capability and incredibly high screen resolution of the new all-in-one devices. The devices are extraordinary. When you lay them down on a table, family game night is reinvented. Every player can interact with the screen at the same time! For our first app for the new all-In-one devices, we chose to focus on I SPY because the brand has such a long and successful track record in interactive media. I SPY is THE hidden object game for kids and families. The exquisite photographs and rhyming riddles captivate players. Not only is I SPY beautiful to look at, but its educational content is deep and innovative. The play pattern is such that children don’t even realize they are learning as they play along. The clever riddles require observation and critical thinking, in addition to building vocabulary. Players gain an understanding of vocabulary by searching for the object in the intricate pictures. It’s a unique way for kids to practice word-object association and grow their vocabulary. Additionally, the riddle play is accompanied by fast-paced logic games, which feature the I SPY objects. Players must sort, classify, group, and compare I SPY objects in dozens of interesting ways against the clock for the best score. The gamification encourages children to practice and apply essential cognitive skills. What advice would you give to someone who wants to create education apps? Study your competition. If you’re making an app that teaches the alphabet, you’ll find dozens of examples, but only a few that are outstanding. Why is that? The answer is in the details of how the app is executed. In I SPY Challenger, every sound effect, animation, voiceover line was carefully crafted to build excitement and scaffold learning through levels of gameplay. Creating a truly age appropriate app requires an understanding of a child’s developmental stages and how they think and learn. The riddles and gameplay in I SPY Challenger reflect the cognitive abilities of our target audience of 6-10 year olds. Each platform is unique, and you have to design for what that platform does best. In I SPY Challenger, the pacing, instructions, and levels were created to maximize the multi-player, multi-touch capabilities of the all-in-one device. The definition of an educational app is much broader than ABC’s and 1-2-3’s. 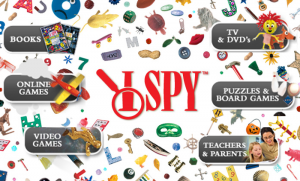 I SPY is educational by focusing on skills such as observation, problem-solving, logic, and vocabulary. Testing your apps during development with kids in your target audience is essential. It’s often full of surprises. Something you felt sure would work suddenly doesn’t. When the testing session is over, the real work begins, which is trying to solve the problems that you uncovered. I SPY Challenger was tested many times with kids before it was released. These were some of the most exciting testing sessions that I’ve ever seen. Kids whom we had never met were laughing and screaming with delight. As always, we found some ways to make the game even better. How have apps and mobile devices changed the way you view education? There are apps for so many different educational purposes: for assessment, for creativity, for organization, for content. Teachers and parents need help sifting through the white noise to find apps quickly that meet their needs. Scholastic is looking to fulfill their needs by providing innovative apps that reflect everything we know about how kids learn and play both at home and in the classroom. Person who inspires me most: My three sons. Favorite childhood memory: Summers at sleep-away camp. When was the last time you laughed? Why? This morning, with my toddler. What is the best advice you have ever received? Do something every day that makes you happy. This entry was posted in 21st century skills, Beyond the Classroom, Information, People, Personalized Learning, Virtual Learning Environments. Bookmark the permalink.